Why haven't I blogged in a week? We are up to our eyeballs in apples around here and I haven't been able to make my way to the computer. Well, that is not totally true. Michael's parents came last week and we went to a local apple orchard and had a blast. However, I think we overestimated how many apples we would need. It was just so much fun! Of course "riding" into the orchard was pretty cool for dad and the smallest small. Although, their ride out (downhill) was most spectacular. 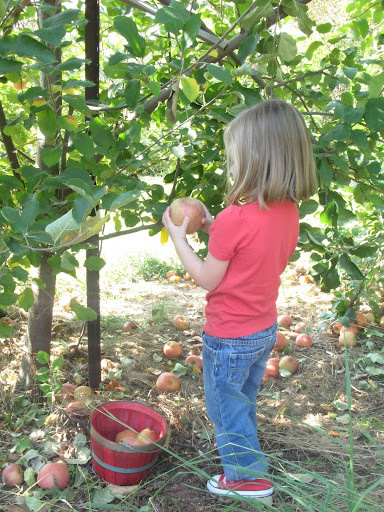 The kids really loved picking the apples right from the trees and they loved sampling to see which variety they like best. The both agreed on that Pink Lady takes the prize. I put up ten pints of apple butter last week and made some dehydrated apple rings. Still on the agenda are apple jelly and apple pie. And since I have plenty of apples, I found a few other things I would like to try: apple cheddar scones, baked apple donuts, and apple cobbler cupcakes with pumpkin pie frosting. Who knows how many I will actually try, but don't they all look sooo good? i keep thinking we have completely missed apple season. i just need to get out a do more! i'm starting to feel a little stir crazy, but then i do get my kids out and think...why did i do this?! two toddlers and being pregnant, i guess. :) i think that i need to apprentice you in the kitchen. I've been making Slow Cooker Apple Butter. Really good and easy. No more standing over the stove, stirring. I'll start the rest tonight when I get home. I'm going to try the apple donuts. Sounds good. wow! very impressive. i have yet to try apple butter and i have been wanting to make apple pie all season- must make it soon. apples are really amazing, i never tire of them. 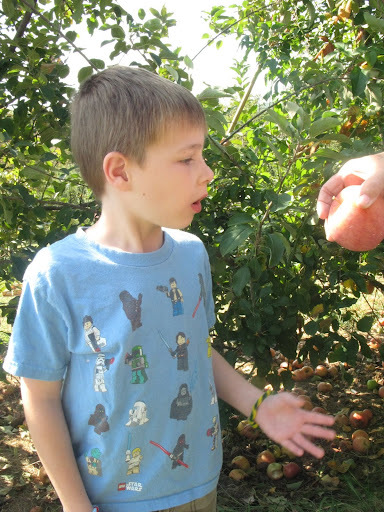 What fun photos of apple picking! Wish we had an orchard nearby.